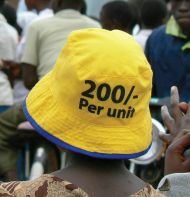 Africans have long organized their savings informally. Small groups of friends, colleagues or neighbours would come together every few weeks in their homes to discuss their financial contributions to their “chaama”, as these small investment groups are called in Kenya. population did not have access to bank loans. The investment groups were thus the only way to have access to a larger sum at once at least once a year. More elaborate groups even reach amounts that allow them to invest in real estate, hospitality businesses and private equity. In Kenya, the concept of “harambee” (spirit of shared responsibility and collectivism) forms a unifying element between fellow Kenyans as they contribute financially to each others’ wellbeing, ailment or celebrations, making it an important social fabric of the country. The mobile phone has changed this. The mobile money service M-Pesa has fundamentally transformed Kenya’s economic and social landscape as it has dramatically increased the inclusion of Kenyans in the formal financial sector. The service allows users to make money transactions without the need for a bank account. Users can pay in cash to their accounts and have the actual money paid out at M-Pesa agents across the country. 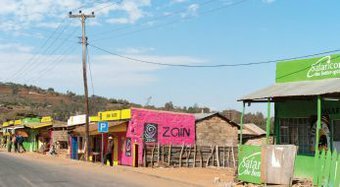 Many kiosks and shops boast an M-Pesa number which enables their customers to pay with their mobile phones. A daily average of $50.6 million flows through the service via 1.6 million transactions. M-Pesa has a customer base of over 18 million customers and accounts for 30 percent of all financial transactions in Kenya and 50 percent of all mobile money transactions globally. The global mobile transaction volume reached $171 billion in 2012, according to technology research firm Gartner, which forecasts the market to grow to $607 billion by 2016. "Mobile payment services have disrupted the way African banks operate." M-Pesa has allowed Kenyans to safely transfer money to each other regardless of whether their remote village boasts a bank branch or a road to the nearest city large enough to host one. But the banking system that rests on the mobile services goes beyond that. It can also offer access to finance. M-Shwari, a partnership between telecoms firm Safaricom and the Commercial Bank of Africa has developed the mobile banking service from merely being a mobile „wallet“ to acting as a mobile bank. The service provides micro loans of as much as $12,500 and accepts deposits of as little as $0.01. This means that all members of society and especially those in the informal sector have access to financial services from one of the services‘ 67,300 agents across the country. This is an important step as the vast majority of Africa‘s workforce are working in informal jobs on a day-by-day basis. Mobile payment services have disrupted the way African banks operate. Established banks and financial service providers had no choice but to adapt their models to suit this mobile money savvy audience. But this innovation has also driven changes in African society by enabling new kinds of collaboration. Now, family members and friends across different parts of the country can contribute to a funeral expense, for example, both those who have bank accounts and those who have never in their lifetime stepped into a bank. Even illiterates take part in this mobile collaboration if they possess sufficient functional understanding of smart phones to send the money. Mark Kaigwa is a consultant, technologist and blogger based in Nairobi, Kenya. Technology continues to transform Africa as innovation is accelerated in particular by the breathtaking spread of the mobile phone. Mark leads by advising brands, businesses and nonprofits aiming at impacting the hundreds of millions across the continent. In his most recent work, he led the digital advisory for “MamaYe”, a fiveyear campaign that aims to use information, advocacy and evidence to improve maternal and newborn survival in six Sub-Saharan African countries.